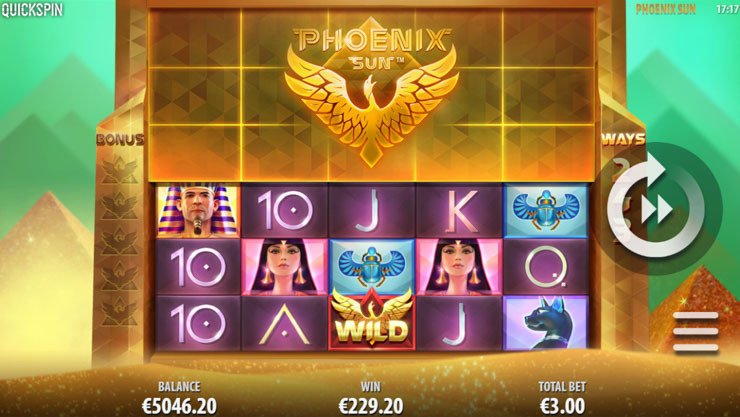 On December 13th 2016, QuickSpin announced the release of Phoenix Sun which is a game inspired by the legend of the bird that rose from the ashes. Egyptian theme video slots have always been very popular with online casino players and QuickSpin knows that. Even though it’s surprising to see a non-Christmas theme game being released in December it’s logical for QuickSpin join this growing trend. The Swedish game provider has always created video slot with new mechanics, and this game makes no exception to this rule. Whilst their game portfolio is quite a small, QuickSpin has always preferred quality over quantity. What can you expect when playing Phoenix sun? This game is truly unique and you’ll notice it as you play and progress. When you first launch Phoenix sun, the game will perhaps look ordinary because it has 5-reels, 3-rows and 243 ways to win. But look carefully, the reel has a hidden part to it and you’ll unlock it with every winning phoenix Wild symbols. Unlocking parts of the reel will eventually turn the game into 7,776 ways to win, 5-reels and 6-rows. The game features free spins and re-spin. The minimum bet on this game is 25p and the maximum bet is £100 per spin. You can win up to 1649 times your stake and the RTP (return to player) is 96.08%. This is a medium volatility game which is ideal for new casino players. Phoenix sun is available on a desktop, mobile and tablet. Where can you play QuickSpin Phoenix sun? Quick Spin games are available in over 25 online casinos, including brands like InstaCasino, Mr Green, Casumo, Thrills, and Rizk. Make sure to check out our welcome bonus section to see what great offers these trusted casinos can give you on your first deposit.